Football season is here and that means it’s time to fire up the grill and start sharing some of your favorite Tailgating creations with family and friends. Well, we love to grill here in our home – whether it’s over the open flame or in a pan on top of the stove! 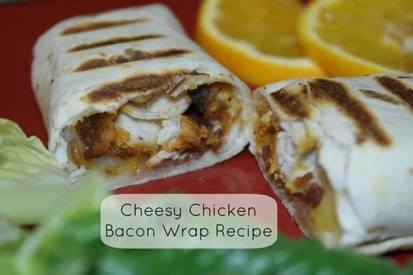 In fact, we recently created a Cheesy Chicken Bacon Wrap that the entire family enjoyed. Oh my gosh – it was so good! 1 – Heat up the Tyson Chicken Buffalo Tenders in the oven until heated through. 2 – Cook the bacon while chicken is heating in the oven. 3 – Slice the Tyson Chicken Buffalo Tenders. 4 – Place a row of sliced chicken on the tortilla. 5 – Add cooked bacon on top of the chicken. 6 – Sprinkle desired amount of cheese on bacon. 7 – Fold the burrito. 8 – Grill in pan for 5 minutes with spatula pressing down on wrap. 9 – Flip and repeat. 10 – Serve with salsa and sour cream. Enjoy!